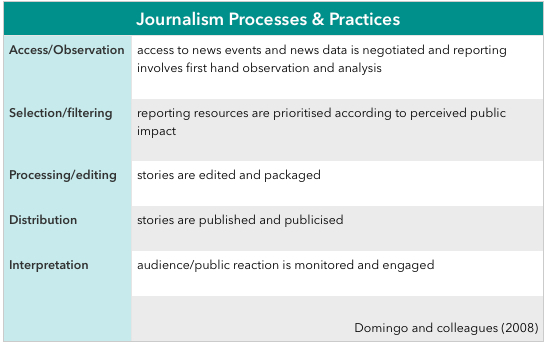 The emergence of digital networked journalism has caused a major shift in both the practice of news organisations and the curriculum of journalism education and journalism remains a volatile industry. Technological innovations and interpretation of the implications of these innovations continue to emerge at a fast pace. However although journalism is going through a period of significant change driven by digital innovation and the networked environment there has been a strong feeling among many journalists, editors and educators that basic skills remain more important than advanced computer literacy. A variety of studies of what skills are valued by journalism employers (Callaghan and McManus 2010; Nankervis 2005; Dickson and Brandon 2000; Criado and Kraeplin 2003; Huang et al 2003) indicate that they prioritize traditional skills including basic writing, punctuation and grammar over computer skills and technological literacies. What are the implications for innovation if what has gone before is always presented as best practice? Where, indeed, when one trainer explicitly states, “we are trying to create journalists in our own image, it is a chance to shape people” and further, “we try to influence them culturally”? This constant emphasis on replication would seem to leave little space for the notions of innovation and change (Bowden et al 2000, quoted in Hughes & Barrie 2010). The pressure of media change itself may also be one of the factors influencing the results of these surveys: in increasingly pressurised newsrooms where editorial resources like sub-editors are being reduced it is not surprising that managers are prioritising graduates ability to produce good old fashioned clean copy. However this traditional view is changing. The respondents to our survey also reiterated the need for traditional skills around writing and presentation (grammar, spelling familiarity with traditional news forms); around general knowledge and around news sense (generation of story ideas and story research sourcing capacity) but many were also very adamant that adaptable multimedia skills and an understanding of convergent digital delivery platforms were essential. This indicates a shift in current thinking as major news organisations move to a digital first strategy and rationalized convergent newsrooms that see journalists working across both web and print products. These results are reiterated by O’Donnell and McKnight (2012) in their survey of journalists and editors where multimedia skills were ranked as one of the most sought after journalistic skills. This constant churn of innovation demands highly responsive, adaptable systems in both industry and journalism education. 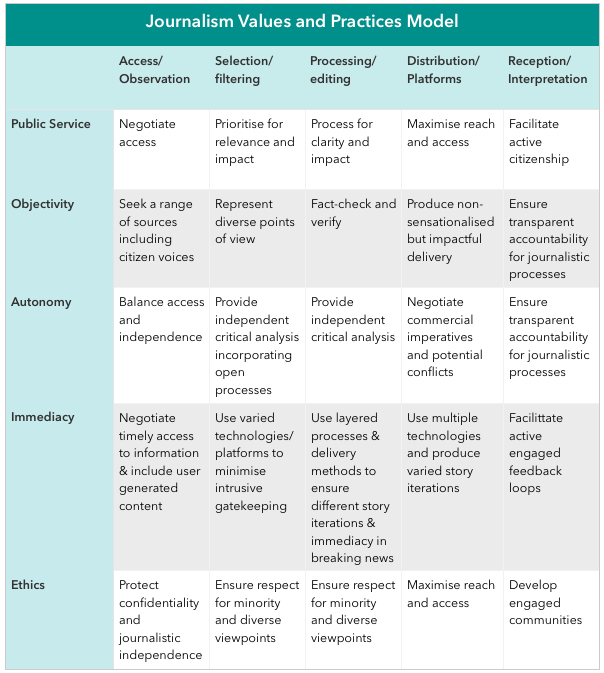 Journalism skill sets and disciplinary knowledge can be conceived along two axis: one which defines a set of professional values and orientations and another which defines a set of industrial and professional practices. These have both been conceived of in a variety of ways by scholars but two recent attempts to articulate these practices and values provide a way of conceptualising these two axis for the purposes of this report. 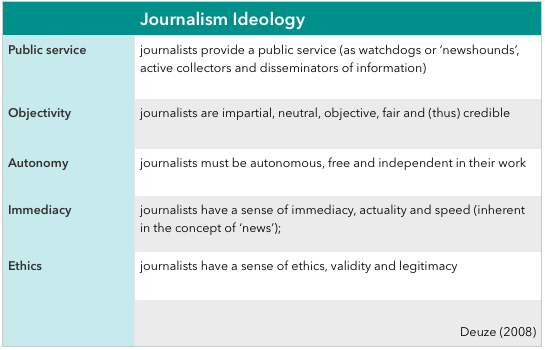 Deuze (2005) in a comprehensive investigation of what he calls professional journalism ideology identifies “five ideal-typical traits or values” which he argues are the key characteristics of journalism’s professional self-definition. "Universities can’t create newsrooms, much as we try. The kind of dysfunctional, strange, unique environments that newsrooms are can’t be manufactured within the university setting. There are certain things that we can do. We can provide deadlines, collegiate activity, you know some of the roles, some of the hierarchies, but you know that kind of rush, that pain, that you know nausea, that ringing ears from getting whacked around the head by an angry chief-of-staff. You can’t replicate that. " "It’s interesting how a press release can frame a journalist’s thinking about an issue … it might be a kind of generational kind of generalization, but there’s a lack of scepticism that I see in some of the young reporters that’s concerning and that’s something that marks more experienced journalists. They’re very sceptical about everything, probably to a fault, whereas young reporters take it very much as a press release might be gospel, so there’s that … lack of critical thinking. " "I find that the biggest thing is that a lot of the Journalism [programs] are not producing people who actually consume the media that they want to work in. So you talk to them about where they are getting their news from and quite frankly a lot of students who want to become journalists are not actually reading, watching or listening to the outlets that they actually want to work for and not actually that aware of news "
"Most reporters pick up quite quickly how to deal with other human beings, what they need to be told I think is in the real world, you need to get out and actually talk to people face to face, too many of the young reporters just want to send email questions out or you know talk to people on the phone they’re actually not relating to human beings and working out how that person’s behaving at the time therefore getting another insight into what may be a better story, "
"One of the ways in which journalism has changed in the past even five years is that it’s gone from – like the task might be go and write a story, go and interview this person and do a story now the task is – moderate this discussion, or provide content around this issue. And that’s one area where a lot of the young reporters seem quite good and are happy to do it and even though the job or the task is more kind of, it’s not as clearly defined they’re kind of comfortable doing it and they understand it. Whereas some of the older reporters who are more fixed in – well that’s a story and you write it for the paper and then put it online – don’t get it. " "The other thing I think you know can be a weakness that we see, is that not really knowing how to go about getting stories so not really sure where to look for stories. They’re OK at chasing stories if they’re handed to them, you know, here’s a story – go. But they’re sometimes not as great at sort of initiating it, having the ideas of what can and can’t be a story. Now you’re realistic enough to know, that new people into the industry after graduating aren’t going to be able to you know suddenly walk in and say you know I’m going to get a Walkley award winning story, but um, that sort of idea of news sense and where to go looking for stories I think can be underdeveloped in some of the kids that we see coming out of uni."